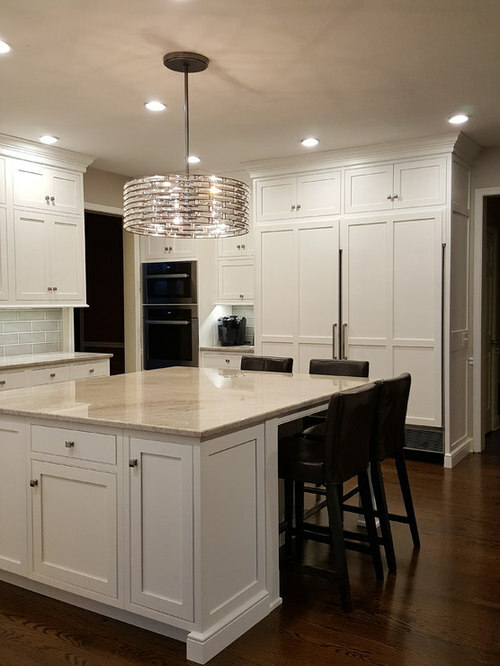 This Bucks County kitchen evolved from a dark, closed in and uninviting space, separated from the family room, to a bright and cheery space, now one with the family room. 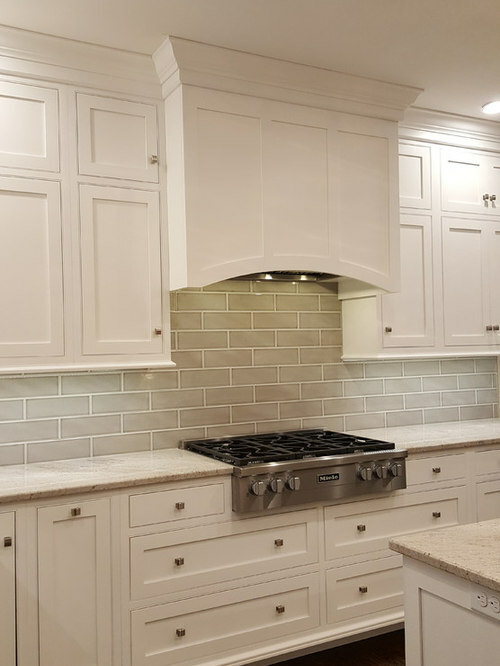 Beaded inset cabinetry with recessed center panel mission-style doors were design up to the ceiling, finished off with a two-piece crown detail. We reused the original Sub-Zero 600-Series refrigerator and freezer, providing a vertical cavity height suitable for today's taller models. The island seats four comfortably and features hidden storage in behind the knee area, in the core of the island. 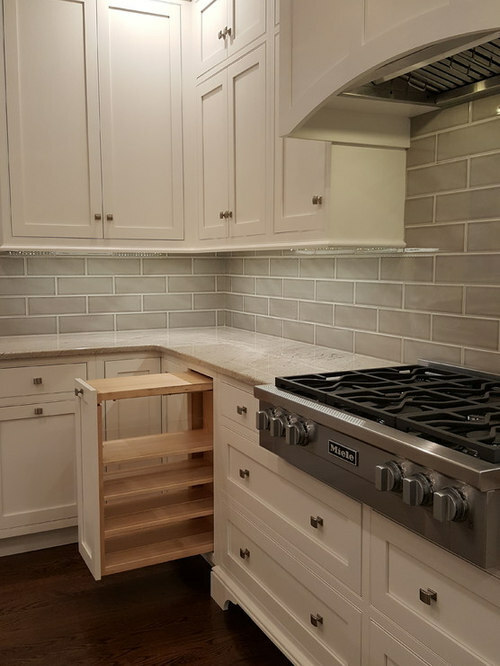 Cabinetry by "The Shop Kitchen and Bath"
Note the pot and pan drawers below the rangetop. 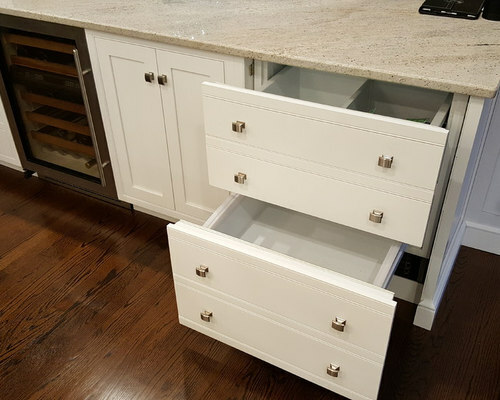 Left Hand Drawers designed to provide a gas line chase. The arched front hood, while modest in design, provides ample ventilation with its baffled stainless exhaust unit. 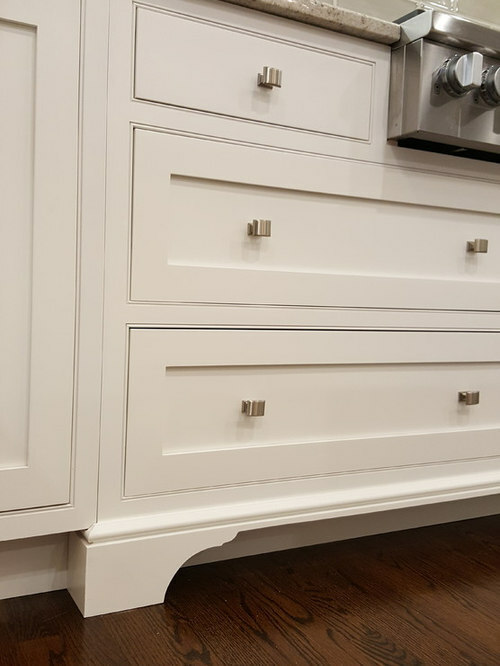 The rangetop base cabinet features a hutch foot bracket detail. 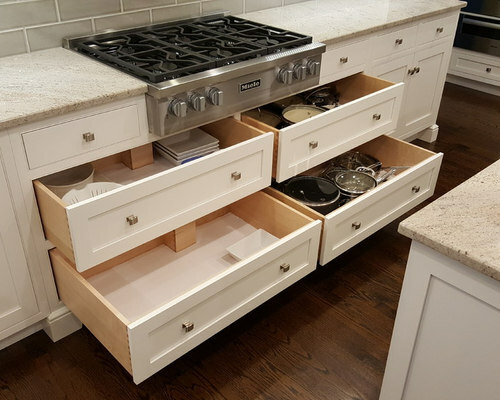 There's ample storage in this kitchen. 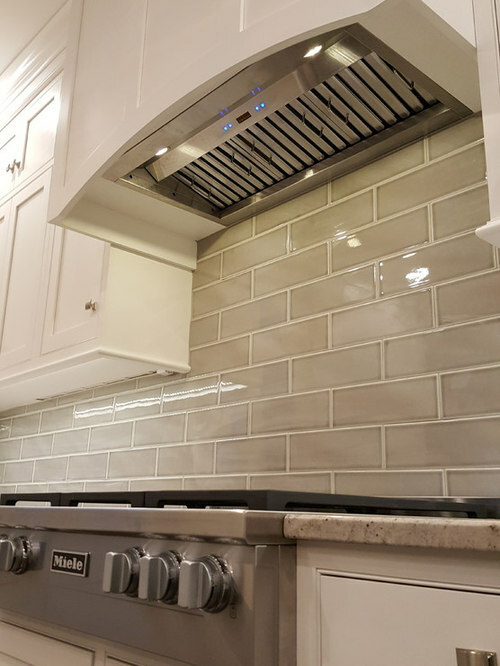 The Miele 36-inch stainless gas rangetop sits atop a 72-inch wide custom base cabinet with four large pot and pan drawers, flanked by utensil drawers. 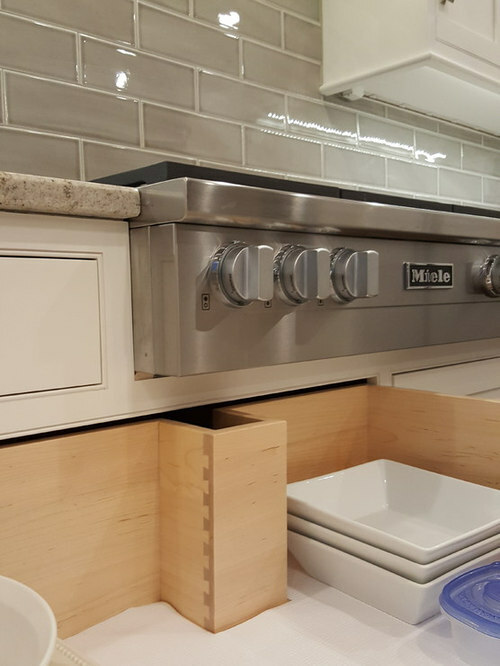 A pull-out shelving unit is positioned just left of the rangetop. 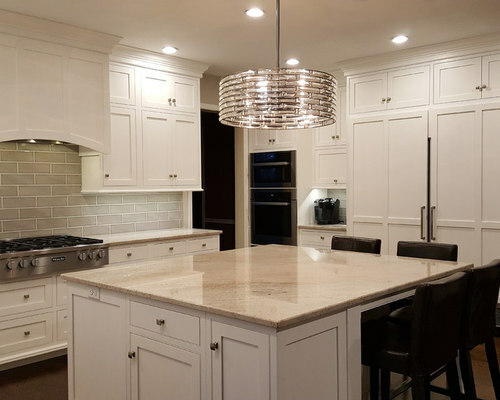 The island is a near 5-1/2-foot square, featuring seating for four, hidden storage within and ample storage for the cook and family members. 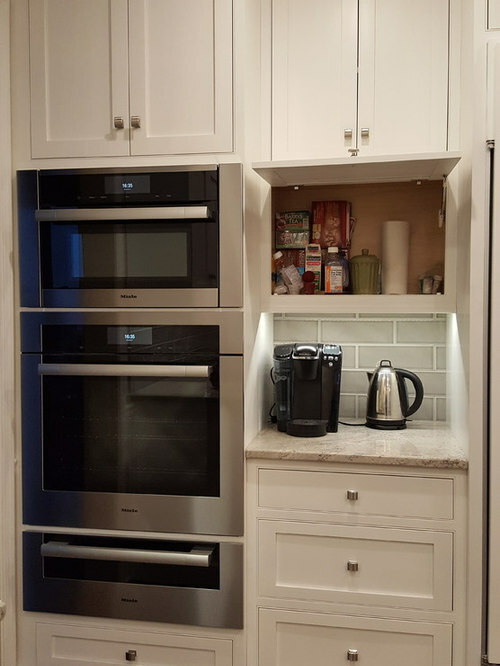 The relocated refrigerator and freezer share a wall with a Miele Speed Oven, Single Oven and Warming Drawer. The coffee maker and tea pot sit atop a counter in the middle. A lift-up door was designed above to allow easy access to coffee and tea needs. 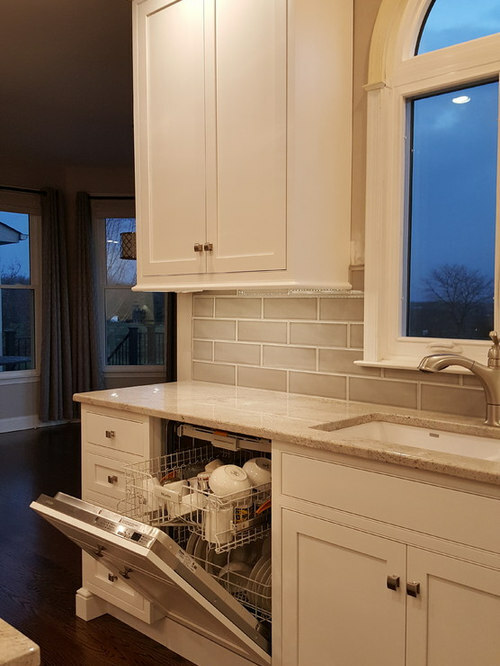 Undermount quartz sink with hidden Miele dishwasher to the left. A view to the (now open) family room, where we're now making custom built-in's for the fireplace wall. That work will include a new fireplace surround and mantle, open bookshelves with 5" beaded board backs. Check back for that--Summer of 2017. 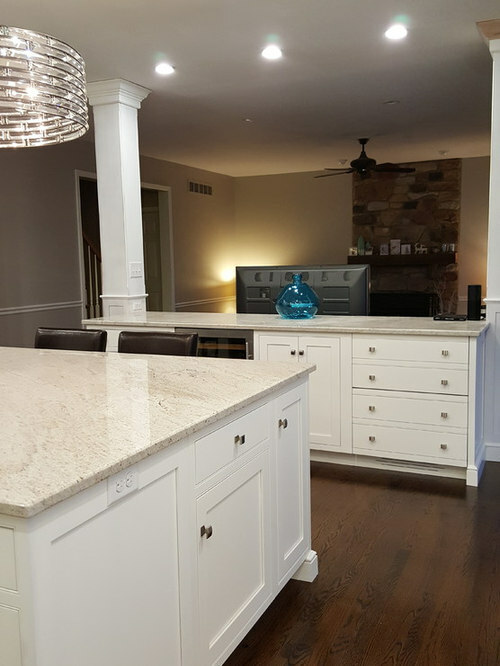 The (I'll call it) second island resides between the family room and the kitchen. This is where the wall was removed. To accommodate the existing plumbing and electrical to the second floor, columns were designed and made to camouflage the necessary utilities. We did reuse both a 24-inch Sub-Zero wine cooler and a 24-inch Sub-Zero Refrigerated drawer unit. 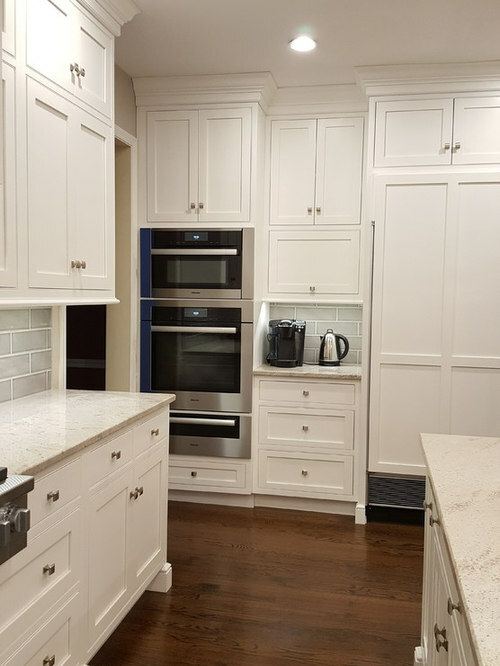 We needed the entire wall to accommodate both the 36-inch refrigerator and freezer, together with the ovens and counter space. This left no room for the existing switches as you enter the room. 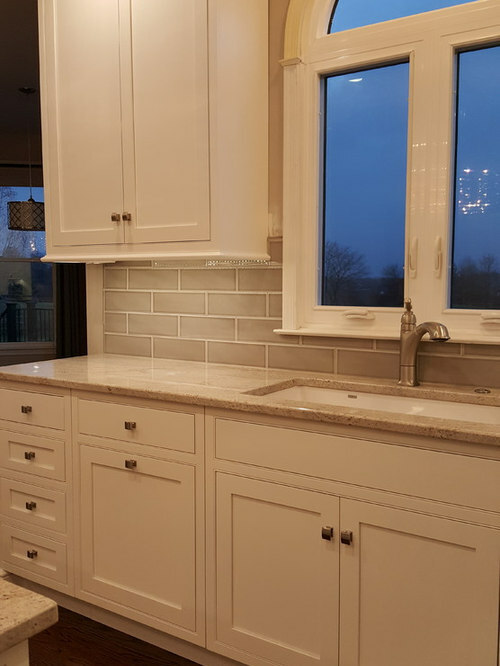 Since there was no other location for them, the wainscot end panel was designed with a wider rail to allow for the relocation and easy access of the three switches. 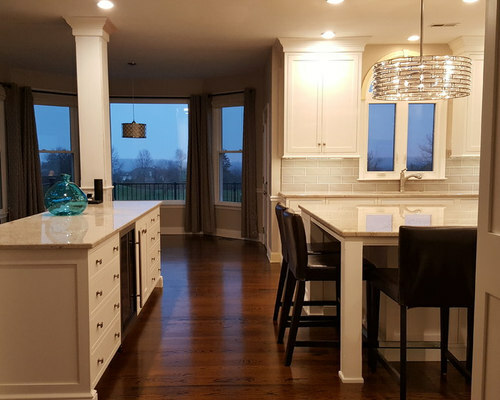 The homeowners wanted certain simplicity in design and detail. 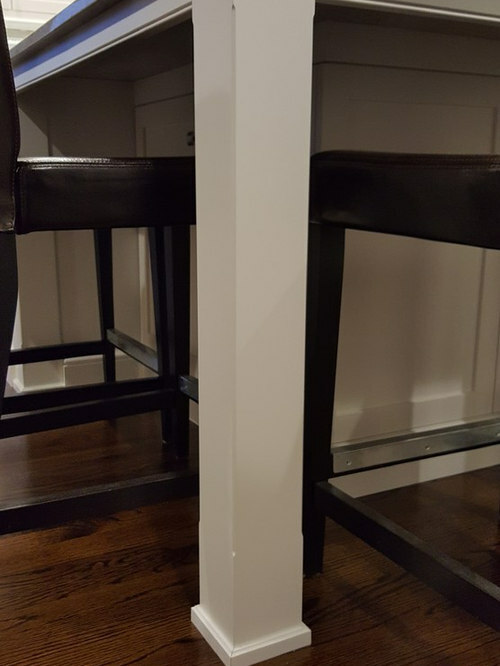 A custom 4"x4" post with a chamfered detail was made to support the stone counter at the seating area. A 2-1/2-inch beaded apron panel was used to tie it all together. Ample hidden storage is found beyond the knee area.